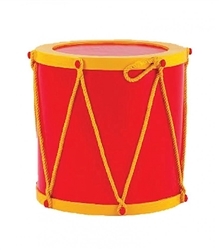 24" Tall Drum base to go with our Toy Soldiers and Nutcrackers. It is a full drum. Just sit your statue on top and it fits perfectly. Indoor/Outdoor use. Some customers use them as tables to create a cheerful atmosphere. Indoor/Outdoor use. Made of fiberglass.